Dengue is on the rise with seven deaths being reported in the past two months and the past two weeks alone seeing 599 cases, bringing the total to 44 deaths and 26,243 cases for this year, a health official said. However, the highest number of deaths and cases were observed during the first quarter of the year, while there was a drop in the second quarter, the official said, warning that once again an increasing trend was observed. More than 4500 cases were reported particularly in the past two months. The official said this was due to the prevailing weather and negligence by the public. In spite of the increase the Epidemiology Unit data indicate that this year has seen the lowest figures compared to the past four years. According to the official the numbers dropped in August and September mainly due to the success of the dengue campaign. Following the recent rise in the cases a programme to inspect houses and public places in the Western Province was carried out from last Monday to Wednesday (December 7 to 9). The National Dengue Control Unit said officials visited 53,158 premises and more than 8,750 potential dengue mosquito breeding places were discovered while 1093 sites contained mosquito larvae. 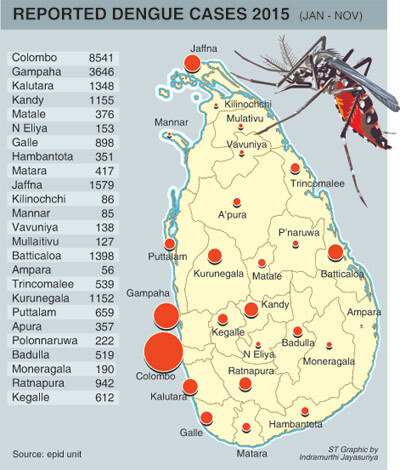 “We observed that the numbers have increased and this is a bigworry,” National Dengue Control Unit consultant community physician Dr. Samaraweera said. She said they also observed a lack of public interest in keeping household premises clean. However Dr. Samaraweera said the public alone cannot be faulted. “There is no proper garbage collection system and this is posing a huge problem. There should be a sustainable programme,” she said. “The caseload in Jaffna had nearly doubled from 76 cases in October to 160 in November. The Colombo District however recorded the highest with 8799 cases this year,” she said. “Reports of new dengue cases keep coming in, however the situation is still under control. But if we do not stem the numbers this month it could get out of control,” Dr. Samaraweera warned. Leaflets urging cleaning up and fogging schools especially those being used as centres for the ongoing G.C.E Ordinary Level examination have been distributed, while new equipment to monitor dengue patients, have been given to several base hospitals, the Sunday Times learns. “The public needs to act now. 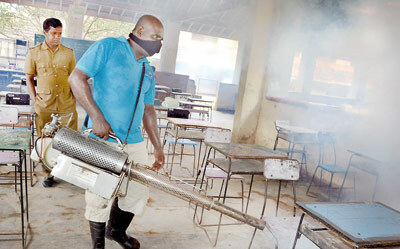 They have to clean their premises and destroy all potential mosquito breeding places,” Dr. Samaraweera urged. She added that if an individual has high fever for two days a doctor must be consulted immediately without resorting to home remedies. “Nearly 75 per cent of deaths due to dengue are among adults, this is because they neglect seeking treatment unlike when a child falls sick,” she said.